If it doesn’t scare you, it’s not worth trying. That’s the approach we took as the Cisco Talent Brand team in our latest social media endeavor. 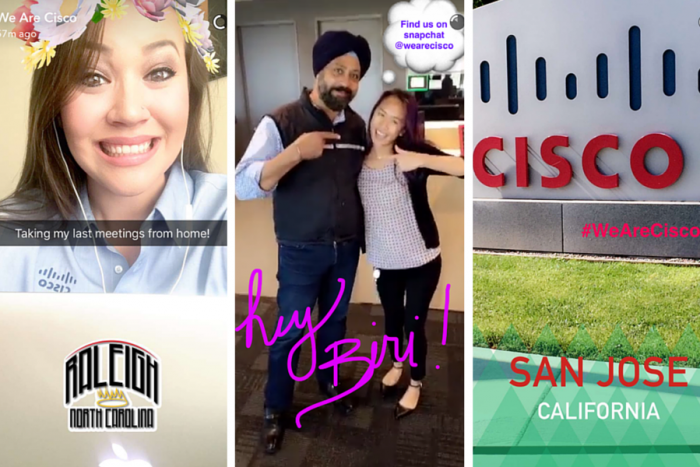 Holy cow, we just launched a We Are Cisco Snapchat channel! But that’s not the scariest part. We handed over the keys to the Snapchat to our employees. As the social lead for the Talent Brand team, I’ve been working in social media since before it was even called that. The mere thought of a username and password in the hands of someone not on the team would’ve given me a heart attack — in any other situation. In this situation, it was the only thing that made sense. As a team, we had been talking about Snapchat for months. As a social media channel, it’s not very intuitive, the user experience is kind of messy, the metrics are practically a Snapchat “ghost” town, it’s definitely skewed towards a younger audience, the content you create just goes away … these were just a few of the excuses not to do it. The biggest challenge was — knowing the (very young) Snapchat audience — what in the world could a Talent Brand team post that anyone would care about? Over the past year, our Talent Brand story has really gelled around the idea of the personal connections we can make with our current employees and technology and future employees. It has definitely become a rallying cry with our employees — #WeAreCisco! We decided that if we were going to really do this, a WeAreCisco account wasn’t what the Talent Brand team would post. It would have to be about our employees. But how would we do that? While growing our talent brand in social (increasing followership on Twitter and Instagram by 950 percent since the summer of 2015 and beating industry engagement standards) we noticed that we had a core group of employees that were our “super” ambassadors. Even with the excitement and the desire, launching and sharing a Snapchat channel with 30 people (and if the pilot works, that number will grow around the globe) is a logistical roller coaster. We created a content calendar, so this pilot group could sign up for a day and a topic. The first two weeks of the calendar were full in 24 hours. Seeing the content calendar come to life at launch, however, was an experience like no other. The Kitten Rainbow Unicorns exceeded all expectations. It made me, personally, a little emotional. I get to see our employees and how amazing they are every day as I create content about their life at Cisco to share with the world. Now, an entirely new audience gets to experience it, and that makes me feel like a proud social-media momma. We’re still figuring it out as a team. Snapchat is a mystery to brands now the way Instagram was a year ago and the way Facebook was in it’s early days (which seems like a lifetime ago.) How will we grow it to a bigger group of employees? How will we measure it? What will we do when we make the inevitable mistake? All this doesn’t matter. The WeAreCisco story is so strong, and our employees are so amazing, if we don’t tell it on Snapchat, that would be the mistake. Carmen Shirkey Collins (@CShirkeyCollins on Twitter and Instagram) is the social media lead for Cisco’s Talent Brand team, and has worked in the social media space for several Fortune 500 companies over the last 10 years. When she’s not driving social media strategy, you can find her writing novels, spending time with her husband and cat, and enjoying shelling and sunsets on Florida’s Gulf Coast.